What was the fate of the beautiful and enigmatic Romulan commander who was captured in the final moments of "The Enterprise Incident"? 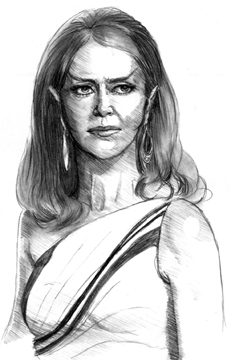 Though surely the most complex and intriguing female character to appear in the original series, the Romulan commander has remained a mystery -- until now. Here, in her own words, is the account of those days and weeks after her capture as she prepares to testify at a Federation inquiry into the Enterprise incident. But Starfleet and the Federation are the least of the challenges that await her. What of her impending return to the Romulan Empire, where she must stand trial -- and face almost certain execution -- for dereliction of duty? What end will the Enterprise incident be made to serve in the dangerous and devious arena of Romulan politics? And what of her conflicted feelings for her apparent betrayer, Spock -- the touch of whose hand set in motion a chain of events that would alter the destiny of both the Romulan and the Vulcan peoples? Unspoken Truth: The Romulan Commander's Story ties together many controversial strands of the canon. It reveals why the Treaty of Algeron was signed, and why the Federation failed to develop a cloaking device until nearly 100 years after the Romulans did. It also offers a finely drawn portrait of a woman whose keen intelligence and fierce passion command our attention from the very first page. My deepest thanks to the following people: Dorothy Fontana, for creating the character; Joanne Linville, for bringing her to vibrant and compelling life; Carolyn Clowes, Jeanne Dillard, Diane Duane and Peter Morwood, and Vonda N. McIntyre, for sociocultural insights; Shane Johnson, for Kaferia; Francine Geraci, for editorial advice, technical support, and the sharing of culinary and metaphysical knowledge; Claire Gabriel, for critical encouragement when it was most needed; Larry Johnson, for two years of patient listening and clear thinking; Aerlyn Weissman and Tayva Carroll Wilson, for permission to do the obvious; and DRush, for the exquisite portrait that appears on this page. This story was first published in 1996 in zine format. The zine is now out of print. Readers who own the original publication will notice that some slight changes have been made to the text of the prologue and epilogue to bring those sections into stylistic line with the sequel, Any Other Lifetime: Book II of the Romulan Commander's Story, which of course didn't exist when Unspoken Truth was first published. These changes have no material impact on the storyline or the characters. The events in Unspoken Truth are based on the TOS episode "The Enterprise Incident," written by Dorothy Fontana. The prologue and epilogue are set approximately one hundred years later, in 2369, at the time of the TNG episodes "Unification, Parts 1 and 2," written by Michael Piller and Jeri Taylor. The official encyclopedia and chronology, in the editions that were available at the time this novel was written, both cited the date of the Treaty of Algeron as 2160. Because that treaty specifies, inter alia, that the Federation may not incorporate cloaking technology into its armament, and because, as far as we know, the Romulan Empire itself did not develop a viable cloaking device until sometime in the mid-twenty-third century (see the TOS episode "Balance of Terror"), it seems reasonable to assume that the date was erroneously cited. For the purposes of this story, I have adopted Diane Duane and Peter Morwood's hypothesis that the Romulan Neutral Zone was established after the Earth-Romulan Wars by the Treaty of Alpha Trianguli, ca. 2160. My best guess is that the first Treaty of Algeron was ratified in late January 2269, and that amending protocols were signed at unspecified intervals after that date. One of those protocols was probably signed ca. 2310; it is likely that this amended version of the original treaty is the one mentioned by Captain Jean-Luc Picard in the TNG episode "The Pegasus." © 1996, 2002 Kathleen Dailey. All rights reserved. No part of this work may be archived, reproduced, or distributed in any format without prior written permission from the author. This is an amateur nonprofit work, and is not intended to infringe on copyrights held by Paramount Pictures or any other lawful holder. The lyric fragments quoted in chapter 19, extrapolated into a possible twenty-third-century version, are from The Rankin Family's "Fare Thee Well, Love," © 1990 Jimmy Rankin (SOCAN).